The NavCoin network is secured by Proof of Stake which is a form of network consensus that requires only a minimal amount of computing power. There is no requirement to have specialised computer chips or expensive mining rigs since increased computing power does not lead to increased mining rewards. At the beginning of 2017 the NavPi was released, a Raspberry Pi computer the size of a credit card, loaded with the software and interface to participate in securing the NavCoin network. Since then, the NavCoin blockchain has grown and the onboard memory of the NavPi struggled to keep up with storing all the block headers. Since then, NavCoin Core has been looking for alternative low powered devices to take over the reigns from the NavPi. A couple of months ago work began on creating the NavDroid interface for the Odroid XU4. The beta version of this software is now available to the public for download. The software provides the basic functionality for mining on the XU4 device; Send, Receive, Transaction Lists, Community Fund Voting, Encrypt, Backup and Restore. The software is built with NodeJS and Angular, and fully open source. We encourage any web developers or designers who would like to get involved in working with blockchain to try the software, test it and help to fix bugs or improve the user interface. What we’ve released today is simply a starting point for the community to run with. 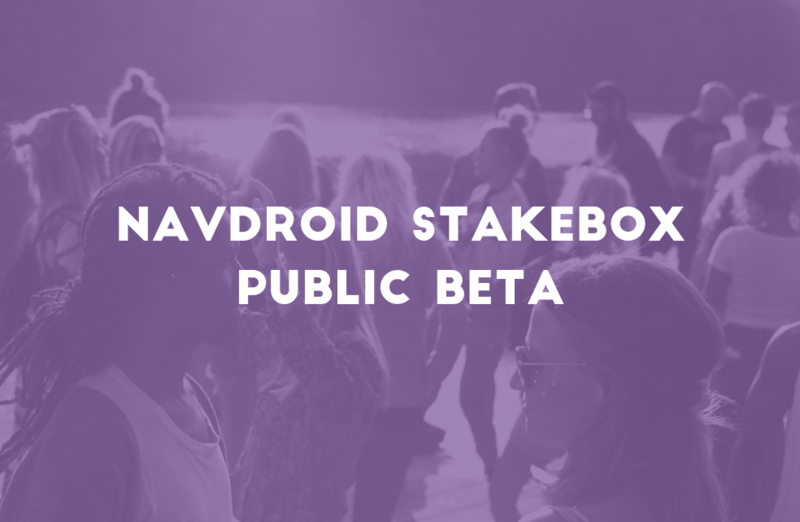 Until the software has been fully peer reviewed and any bugs fixed, we recommend using the NavDroid with caution and not using it as your primary mining device. You can install the repositories on an existing Odroid by cloning the software from GitHub, or if you want to download the image, join the community on discord to get the download link. NavCoin Express is the NodeJS back end server that interacts with the daemon and provides the API to the front end. NavCoin Angular is the Angular front end web server that provides the web interface for controlling your NavCoin wallet. If you find any bugs or want to make any improvements, please create an issue or a pull request on the appropriate repository and join the community on discord to discuss. The NavCoin Knowledge Base has been relaunched as a hugo static site served from GitHub. Moving away from Wordpress means that the knowledge base can be more easily contributed to by everyone in the community rather than only a select few moderators of the site. Contributing to the site does require some knowledge of markdown and GitHub, but it’s not necessary to be a developer to add an article. We’ve only had the time to seed the knowledge base with a few of the most important articles so far and would appreciate any help the community can offer in turning the knowledge base into a thriving resource for NavCoin. If you browse the knowledge base and notice something missing, consider writing it up as a guide and submitting a pull request on GitHub. The design of the site is also pretty basic so far. If you have HTML and CSS skills, and are interested in helping to improve the design or user experience of the site, please get in touch with us on discord and we can set you up as a collaborator on GitHub. With these additions you can buy or sell NAV on 24 platforms so far worldwide. More exchange listings for NAV means more exposure for the project, more regional fiat on and off ramps and of course additional redundancy when it comes to buying or selling NavCoin. We encourage the community to review these exchanges and support diversity by trading on them if they pass due diligence. One of the most important exchange listings NAV achieved recently was the reactivation of the NAV market on Bisq. Bisq is an open source, decentralised exchange that offers a high level of security for trading. When trading on decentralised exchanges, the coins you are trading never leave your computer until the trade is completed, drastically reducing the risk of exit scams or exchange hacks as have been experienced by even some of the biggest cryptocurrency exchanges in the industry. Like the saying goes “Not your keys, not your coins” and Bisq keeps you in control of your private keys the whole time. As a project which is highly focused on decentralisation, making Bisq a primary market for NavCoin would help to further this mission. If you’re currently looking to buy or sell NAV, consider using Bisq and placing your orders there. Last week NavCoin Co-Founder Craig MacGregor flew down to Wellington to talk with The Crypto Lark, one of New Zealand’s top blockchain and cryptocurrency youtubers. The interview covers a range of topics including the state of the markets, proof of stake vs proof of work, private cryptocurrencies and of course the latest of what’s happening in the NavCoin ecosystem. Make sure you subscribe to TheCryptoLark on Twitter and YouTube. His channel is a great source of crypto current events, project reviews, interviews and recently he’s published an education series on crypto and blockchain. BitPrime have featured NavCoin and its Community Fund in a review published to their site. The review covers everything from NavCoin’s history, how the Community Fund works, how NavCoin’s governance works and its uses in the real world. BitPrime is a direct purchasing platform based in New Zealand that offers purchasing of a range of cryptocurrencies including NAV with NZD. If you’re based in New Zealand and looking to purchase crypto, check it out and get in touch with them. There is currently 100,400 NAV available in the community fund with 5 pending proposals and 2 pending payment requests active being voted on. If you are staking coins make sure you head on over, learn what they’re about and cast your votes.